MARK becomes more rich and intense as we gather as a group. This is why there are many local MARK groups across the world. BUT, for one reason or another, many in our community are unable to attend a live MARK Group on a regular basis. Because we don’t want anyone to miss out on the power of community, we’re reaching out to invite you to attend the Virtual Monday Mark Group to share in the rich experience of gathering as a group to discuss MARK every Monday at a convenient time for our European community (9pm/21:00 CET, 2pm MDT). In each class, MARK sets up a complex energy formation around each person in the group - and this is not limited to those attending live in Denver. This allows all of us to travel together no matter what our experience is. 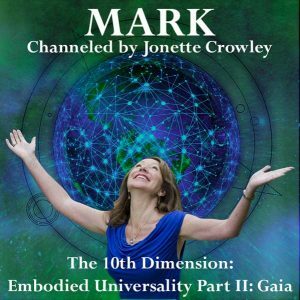 MARK transmits energy to stabilize the group and creates the space for exploration of other dimensions. This energy formation surrounds those tuning in via live-stream, and audio download, and the Virtual MARK group. There is power in numbers! If this sounds like someone you or a friend would enjoy, we’d love to invite you to join us every week to virtually gather, listen, discuss, and experience the most current MARK course. ***Please note that this group is available to those who have purchased the current MARK series. If Jonette is traveling and there is not a current class, the group will listen to a recent previous series. ***(You must also have purchased this series from the Center for Creative Consciousness at www.JonetteCrowley.com ).